Being part of a national trend is no excuse for inaction; the VCCS Board has approved steps to address the historic enrollment declines at Virginia’s Community Colleges. • 17,839,330 students enrolled in higher education in spring 2018 The Research Center says enrollment declines have been sharpest at for-profit schools and community colleges. To learn more about the Research Center’s report, click this link. 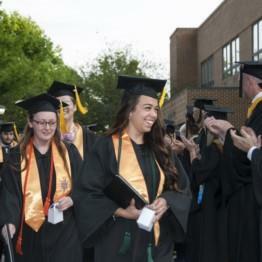 During June, we’ll look back on commencement exercises at our colleges around Virginia, sharing “Pearls of Wisdom” offered during graduation speeches. In today’s edition, we feature inspirational messages from SVCC, TNCC, VHCC, PDCCC and WCC.